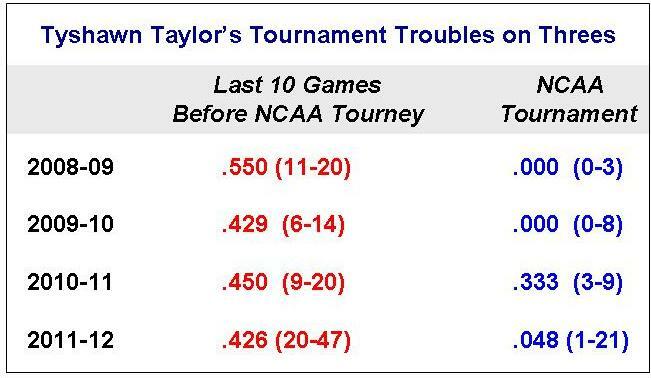 Those who closely followed the recent NCAA men's college basketball tournament are probably aware of the three-point shooting difficulties experienced by Kansas senior guard Tyshawn Taylor. He shot 0-for-21 from beyond the arc in this year's NCAA tourney, getting off the schneid only by making a three in last Monday night's title game vs. Kentucky (on what turned out to be his sole attempt from deep in that game). For the "drama" he created both on and off the court during his four years at KU, this Sporting News article referred to Taylor as a "Shakespearean character." 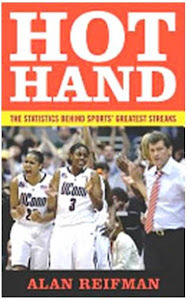 One of the key points in analyzing hot and cold hands is that streaks can be better understood by looking at the athlete's long-term performance record prior to the streak. For example, a stretch of 50 consecutive made free throws will be more surprising coming from a long-term 70% shooter than from someone who hits 90% from the stripe. For this reason, I examined Taylor's three-point shooting statistics for every game of his collegiate career (this link takes you to Taylor's game-by-game statistical logs, with the ability to select any of his four seasons). What I found was what I consider a surprisingly consistent pattern in Taylor's career, as shown in the chart below. 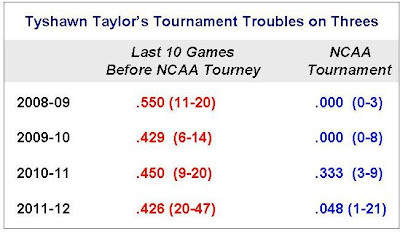 If you look at the final 10 pre-NCAA-tournament games of each season (when players should be aiming to reach peak sharpness for the important competition ahead), Taylor had three-point shooting percentages in the mid-40s (at least), an impressive level. However, each year, once NCAA March Madness began, he could hardly hit a shot from behind the arc. In four years of NCAA-tournament play combined, he made only 4-of-41 attempts (.098). Whether Taylor can make the NBA, I don't know. He was a third-team All-America selection this season, so I suppose he has a chance. However, I think we can be confident that, even if he makes it, his role as a professional probably won't be as a three-point specialist! This is great. I had no idea the trend stretched back to his freshman year. If he does carve out a career in the NBA (big if) I think it will be as more of a defensive specialist w/ a somewhat limited offensive role.